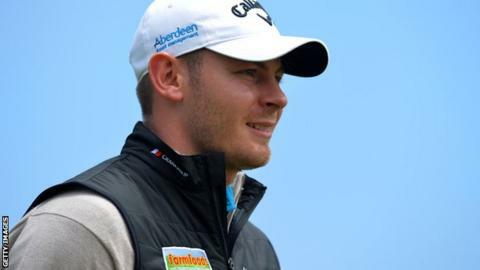 Scotland's Scott Henry set the clubhouse target with a five-under-par 67 in the first round of the severely weather-affected Madeira Islands Open. The tournament has been reduced to 54 holes after persistent fog meant no play at all was possible on Thursday, with a further delay on Friday. A further reduction to 36 holes at Santo da Serra remains a possibility. Some players managed just one hole of their first rounds before play was suspended due to darkness on Friday. Henry had looked set for a commanding lead when he reached seven under par with two holes to play, but he dropped shots on the eighth and ninth. England's Andrew Marshall, Spain's Pedro Oriol and Austria's Martin Wiegele were all safely in the clubhouse on three under, with Spain's Carlos Aguilar and Sweden's Johan Edfors another shot back following rounds of 70. Play is scheduled to resume at 08:00 on Saturday.